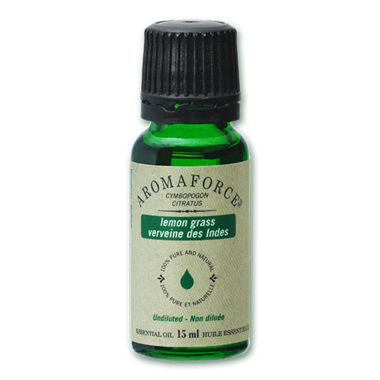 Aromaforce Lemongrass (Cymbopogon citratus) is a 100% pure, natural and undiluted essential oil. Benefits: Used in aromatherapy to naturally repelling insects, and its soothing properties make it ideal for massages. Refreshing bouquet, lemony, herbaceous, dry and cool . Inhalation: Add 3-10 drops of essential oil to a diffuser and inhale slowly and deeply. I use this in a diffuser and enjoy it.